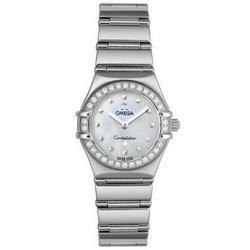 Omega Cindy Crawford Constellation Ladies Watch 1465.71.Omega Constellation Cindy Crawford - Womens Watch 1465.71 / 1465.71.00 / 14657100 / 146571. MINI Stainless steel case and hidden clasp bracelet, diamond bezel with 30 diamonds totalling .42 karats in diamonds (G-H color, VVS clarity), Mother-of-pearl dial with silver pyramid markers, diamonds in bezel set in 18kt white gold, precision Swiss quartz movement, water resistant to 30 meters. Case Diameter:22.5mm. Case Depth:8mm. Bracelet Dimensions:6.75 inches x 13mm.